ServiceMaster of Glenview Golf serving Glenview, IL 60025 and the surrounding communities in Cook County and Lake County IL since 1975, is available to serve both residential and commercial customers for all carpet cleaning, upholstery cleaning, tile floor cleaning and emergency water damage or fire damage clean up needs. 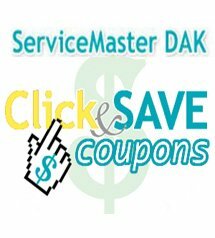 ServiceMaster DAK services residential and business customers through a global network of more than 4500 franchises providing janitorial services, commercial and residential carpet cleaning, hard surface floor care, commercial and residential furniture cleaning and disaster restoration services for your home or business. The ServiceMaster Clean Company has more than 60 years of history as a leader in the cleaning and restoration industry. When disaster strikes your home or business and you have water damage or smoke or fire damage call ServiceMaster of Glenview Golf at 847-724-2506, 24/7/365.